As a student, I always missed having a digital reader to browse my notes, books and lecture recordings. I spent most of my time lugging my laptop to classes, seminars and library, and typing in notes on google docs or creating my mindmaps. When coupled with Evernote, iPhone became a great recording device. And I scraped my way out of grad school. I spent a lot of time researching on the perfect student companion, but there is none that satisfies all the requirements. The physical paper and pen are hard to substitute. When it comes to plain simple reading, it's a lot more straightforward. At present, Kindle and lately iPad dominate in this area, followed by Barnes & Noble Nook and the plethora of cheap digital tables. To state any self selection bias, I own both the kindle and the nook color, and have a borrowed iPad. Let’s begin. Among the three, Kindle is the lightest. It has a 6-inch e-ink display and weights just over 8.7 ounces. The display is crisp and comparable to printed text, and doesn’t strain the eyes. It has amazing battery life and can last for a month (with wifi off). However, the small screen makes it harder to read magazines, A4/A3 sized text books with graphs and illustrations. It also needs a physical light source if you like reading in dark. Amazon probably has the biggest collection of e-books but the store is not available in all countries. The new Kindle has native pdf reading capabilities but the books need to be trimmed to fit the screen better. Kindle also has dedicated page turn buttons but searching and jumping pages needs a bit of getting used to. If you are used to your touchscreen devices, you will inadvertently find yourself swiping the screen in frustration. The lack of an App Ecosystem like the iPad has an advantage. I find myself frequently being distracted by tweets, email or rss updates on other devices. Kindle, however, is the serious book reader which does one thing best, being a great reader. Personally, I love the kindle because of its form factor, screen and the long battery life. It’s an ideal travel companion. Everyone has seen or touched an iPad. It’s an engineering marvel with an industrial design, unparalleled 10hr battery life and an even sleeker design that its predecessor. Why did Apple sell 15Million iPads in its first year? There is no one answer. Beautiful 9.7” display to read full length books, magazines, responsive touch screen, long battery life, a lively AppStore with thousands of great titles and an X-Factor, that says I am Apple and I am cool. As an e-Reader, it fares really well due to larger, touch screen.With all backlight displays, it can’t be used outside, under the sun without serious glare. Even if its own Book Store has limited content, you can always download Kindle or Nook Readers from the AppStore. It is the tablet that redefined this segment, and is quite frankly miles ahead of its competition, both in terms of price and feature. And there is always an App for everything. Having evangelized the iPad, I do have some major issues with the device. I hate being tied down within the Apple Ecosystem. iTunes for windows is still buggy. It is hard to transfer content in and out without external apps. And it is pricey, for a device which replaces absolutely nothing (Except maybe a netbook you never bought). You still need your laptops, phones and desktops.And somehow, it feels heavy after prolonged use. 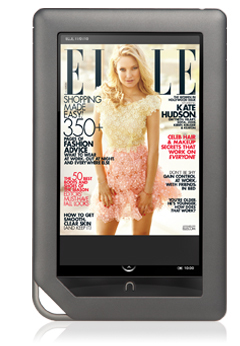 I snatched the Nook Color for $200 bucks off e-bay on a special promotion and it continues to surprise me, ever since. It has a 7’ color touch display and weighs around 15.8 pounds. Underneath, it runs a 800MHZ Cortex A7 Processor and a stock derivative of Android 1.6. Though the stock version of the OS isn’t that exciting, curious developers have rooted it and it now runs all flavours of Android, including the latest Honeycomb, with varying degrees of success. I run a CM7 variant called Phiremod, which overclocks to 1.2GHz and runs Gingerbread. Which also means, one-click access to Google Marketplace and the thousands of android mobile apps on your fingertips. Now to the important question. Is it a good e-Reader. In short, no. It’s a versatile, quite frankly, an impressive tablet but the reading experience is quite fragmented. The Lcd display, though really vibrant, suffers the same issues as the iPad and the battery lasts less than 6 hours of just reading. The B&N web store has a confusing interface. The prices in some cases are higher than Amazon. Pinch to Zoom lacks the fluidity of the iPad and flipping pages aren’t that responsive. Hopefully, these will be fixed in the upcoming firmware update, expected in April ‘11. In fact, you will be better off rooting your Nook and installing Amazon’s Kindle reader on it.You might also want to install adobe’s pdf reader to read color magazines and books. Nook Color has great potential. Though it has sold millions due to it’s hackable nature, B&N is expected to fix these issues in the next update. For now, its my cheap gaming device to play Angry Birds and read the occasional comics. Pros: Vibrant screen, Hackable yet cheap Android tablet, Android Marketplace, Angry Birds! Cons: Buggy reading experience in the stock.